You are here: Home / news / Summer must be coming! 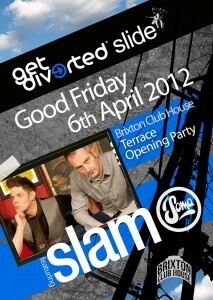 Get Diverted & SlideTerrace Opening Party announced. For the launch of the terrace for the summer, Get Diverted and Slide have landed a very rare non-Fabric London performance from legendary Scottish techno outfit, Slam. In the past two decades, Slam have defined techno in Scotland, cultivated virtually every Scottish techno artist of note, and remixed everyone from Daft Punk to Underworld. Stuart McMillan and Orde Meikle will also be known to fans and clubbers as the brains behind Glasgow label, Soma which just turned 20, as well as their residencies at two of the UK’s best clubs, Pressure in their home town of Glasgow and Fabric. Soma Records continues to be one of the world’s finest purveyors of cutting edge Electronic music, and can claim to be the label that discovered iconic French dance act Daft Punk. Soma’s recent releases and remixes include Adam Beyer, Joris Voorn, Gary Beck, Loco Dice, Mark Broom, Nick Curly and Pan-Pot with recent remixes of Slam originals from Carl Craig, Radio Slave, KiNK and Sebo K. The 20th birthday celebrations have been going on over the past 12 months, seeing parties at festivals and clubs around the globe, plus a host of vinyl, digital and box set releases from friends and affiliates over the label’s 20 year history. Slide and Get Diverted have managed to persuade the boys to play not one but two sets – 2 hours on the terrace as the sun comes down – and a further 2 hours later in the club. Support comes from Hypercolour label boss Cedric Maison, Archie Hamilton, Samantha Blackburn (one of Mixmag‘s ones to watch for 2012), Rob Alldritt and more. A great way to launch the terrace for the summer, with 2 Slam sets on both the Terrace and the Club, this is a party not to be missed.